Walking in the door, the very first thing that’s apparent is the place’s popularity, at barely 5pm on a Friday the place was already seriously packed to the gills, us getting a table only because we were willing to cram three of us onto a two-topper, looking over an eclectic fusion menu that really is harder to classify better than “Asian-inspired fusion”; since there’s everything from fried chicken to quesadillas to ramen to pad Thai on the menu. Quite frankly, it’s a bit more like a “mind dump” from a hungry chef, but all of the items looked particularly good as they came out of the kitchen. 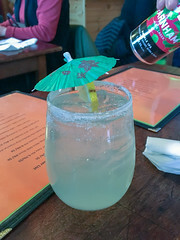 Soon enough, we were enjoying our drinks, myself and our friend Dave having beers (from Vermont/Quebec brewer Farnham), and Carol enjoying one of their cocktails: the Elderflower Sour with elderflower soda, ginger lemonade, and sake. Then, our appetizers started to arrive. First up was the veggie pakoras. 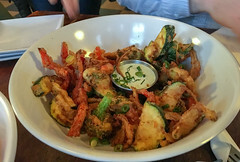 Stylistically, these were a lot closer to American onion rings in a textural way, but this rather worked: the vegetables were cooked nicely to a just-over-al-dente point, with a nice, crispy breading and an oniony dipping sauce. We all enjoyed this and would get it again. 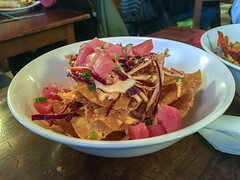 Similarly, the tuna nachos we ordered were a hearty portion of perfectly fried wonton strips topped with spiced cabbage slaw, spicy mayo, and some nice, fresh raw tuna, and this was enjoyable as well: this had the potential to be a greasy mess but the wontons were light and crispy, and each bite would give you a bit of wonton, some tuna, some crunch from the slaw, and a little bit of tang from the mayo. Again, a table pleaser. If you haven’t noticed it yet, “authenticity” isn’t the corrnerstone of Samurai; if you are looking for that, you might want to look someplace else. 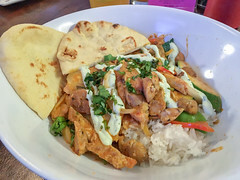 But this fun and funky blend continued through the entrees; my Tikka Masala was probably closer in rendition to a Thai red curry than a true Tikka (itself an odd UK-Indian fusion dish), but it was definitely delicious and tasty: very nicely tandooried chicken with some julienned veggies in a very fragrant and very spicy house-made “curry” sauce. Add in a small naan that was very nicely cooked up with just a bit of char they way I liked it; I’d definitely get this again. 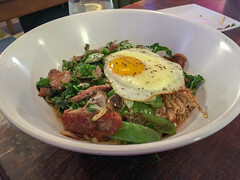 Carol did well with her ramen as well: a bowl of noodles served up less as a soup but as dressed noodled in a very thick, very-gingery broth topped with some pork shoulder and bok choy, this was quite enjoyable as well, although perhaps a bit more broth is in order. 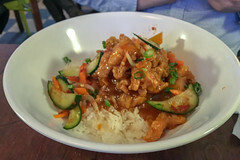 Dave’s selection of the Samurai General Tso showed that the fried chicken (one of the nominal stars of the menu) is very nicely executed, and I found that the glaze was less of the sticky-hot red glaze typical of the dish, and more of a light, fresh, and citrusy glaze. All three of us ended up being very satisfied with our meals, and, overall, enjoyed the service, the price (most main dishes run $14 with generous portions), and the unique combination of flavors. 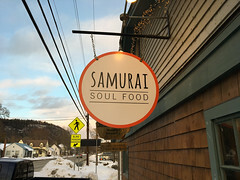 I can see why Samurai Soul Food remains popular. I’ve always been a great fan of gelato. The Italian cousin to ice cream, gelato is a more subtler variation on the same idea. milk, cream, sugar, and flavoring. But just like the idea that while hash browns and french fries are both the same thing (fried potatoes), it’s the difference in execution that makes gelato such a great product. More milk than in ice cream, less air, gentle churning, and a warming serving temperature always make for a pleasant bowl of rich, creamy gelato. 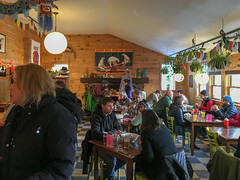 Unfortunately, while ice cream shops are plentiful (indeed, soft serve places are a dime a dozen around here in the summer months), good gelato places are fairly rare in the US. And, until 2010, nonexistent around here. Until Morano Gelato opened up shop.